The Progressive Alliance council – what lies ahead? One month on, and the dust has well and truly settled on the local elections of the 3rd May. As we take stock of the new political landscape at the council level, many will find their attention drawn once again to Richmond, where collaboration between the Liberal Democrats and the Green Party resulted in a crushing defeat for the Conservatives across the borough. We covered the result in a previous blog, but in case you missed it, here’s what happened: joint campaigns between the Green Party and the Liberal Democrats were run in six of the 18 available wards. In all of these wards, the Lib Dems agreed to field only two candidates, urging voters to give their third vote to the Green candidate. In return, the Greens agreed not to stand in other wards, giving the Lib Dems a clear run at freeing as many seats as possible from Tory control. When the final results came in, the Green Party found themselves with four brand new councillors in the borough. The Lib Dems also significantly increased their representation on the council, from 14 seats in 2014 to 39 in 2018, and are now represented in 17 of the 18 wards. This means that, thanks to the hard work of all involved and a real commitment to ‘grown-up politics’, progressive parties now hold 43 out of 54 seats on a council that was previously dominated by the Tories. So, what next for the Progressive Alliance? The result in Richmond has proved yet again that, under the right circumstances, cooperation between progressive parties can and does lead to important and tangible success at the ballot box. The ripples of the Richmond result are clearly beginning to re-energise the Progressive Alliance debate on a broader scale, too. On 7th May, the Monday after election day, a letter appeared in The Guardian co-signed by, among others, Labour MPs Clive Lewis and Jon Cruddas, calling for the reinstatement of party members who had campaigned for a non-Labour candidate in South West Surrey. The candidate in question was Louise Irvine of National Health Action, and the incumbent none other than the health secretary Jeremy Hunt. In the end, Hunt won by a comfortable margin, but Irvine came second, bringing in a vote share well above what Labour could have hoped for in the constituency. The Labour Party has traditionally been hostile to alliance building, a stance which has largely resulted in missed opportunities for all progressive parties. To reinstate members who have, for sound and carefully considered reasons, decided to lend their time and energy to another progressive party, would pave the way for the Labour party to engage properly with the Progressive Alliance in the future and help create meaningful change across the country. Cruddas also appeared, alongside Caroline Lucas, and Gareth Roberts of the Richmond Lib Dems, on the BBC’s Week in Westminster to discuss the case for progressive alliances. The guests once again bemoaned the lack of reciprocity from the Labour Party when it comes to alliance building, but Cruddas did suggest that relevant conversations are currently happening within the party around this subject. All three guests pointed to growing frustration among the public with a rigid electoral system which is no longer fit for purpose, and an appetite for ‘a new, fresh approach to politics.’ The opportunity is clearly there, but will enough progressives have the courage to seize it? Of course, political alliances are never easy to broker, and must be built on a firm foundation of detailed analysis and negotiation in order to survive. To repeat the localised success of the Progressive Alliance on a national scale will require a hard work, trust, and cooperation from all involved. This sentiment was echoed when I spoke to Andrée Frieze, one of the newly elected Green councillors in Richmond about the next steps for the PA. She particularly stressed the importance of communication, pointing to the tendency for all parties (not just Labour) to relapse into tribal politics when we forget to talk to progressive allies on the left in a constructive way. The view was echoed by Frieze’s colleague on Richmond Council, Penelope Frost, who told me that the PA’s success was built on cross-party relationships forged over many years. It’s not enough simply to build alliances during election campaigns only to return to the old, tribal party culture after each election. It has never been more important to remember this. Not only is the appetite for cooperation clearly here, but so too is the necessity. As things stand, it looks unlikely that Labour will be able to win an outright majority at the next General Election under its own steam. Engaging meaningfully with the other progressive parties to unseat the Tories in seats where it cannot win could make all the difference. This idea goes beyond just electoral tactics, and gets right to the heart of a deep-seated dissatisfaction among voters with the reductive choices they are forced to make at the ballot box. 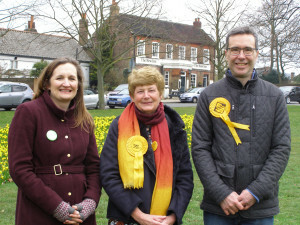 Jonathan Cardy, Lib Dem councillor for Fullwell & Hampton Hill, reported that the PA was ‘extremely popular’ with voters, and Frieze also told me that conversations on the doorstep about the PA were overwhelmingly positive. She suggests that ‘people like to vote for the party they want, knowing it counts’, a luxury that has becoming increasingly elusive under our rigid and outdated FPTP electoral system. Yes, a Progressive Alliance may not be possible, or even desirable, in every constituency or ward, but there are plenty of cases where it could present a tangible opportunity to break the political deadlock which currently grips the country. The missed opportunities of 2017 must not be forgotten. To dismiss the Progressive Alliance out of hand could well result in electoral suicide, and leaves the prospect of a Tory government stretching into the latter half of the 2020s a very real prospect.